Sorry for the long delay in blog posts. No we haven’t sunk, but a lot has been happening around here that was taking up our attention. Foremost among our recent changes is that Dan has taken a new job in Sunrise, Florida which he started Wednesday morning. 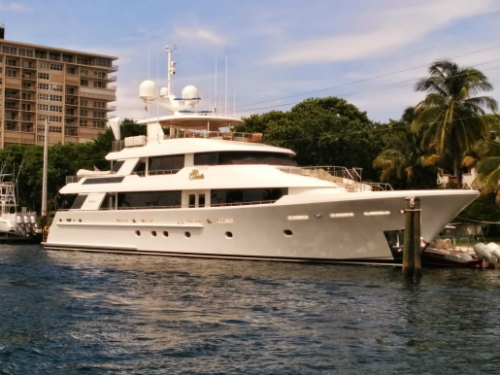 Subsequently, we decided to move our boat from Lantana to Hollywood. While that only takes about an hour in a car traveling the interstate, the ICW is another story all together. 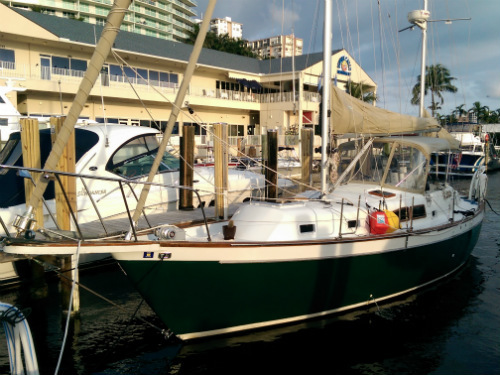 We finally got into Ft. Lauderdale on the second day. For anyone who has ever traveled on the ICW by boat, you will remember the number of bridges that cross your path. Unfortunately for us, of the 21 bridges between Lantana and Hollywood exactly 1 of them is tall enough for us to fit under. 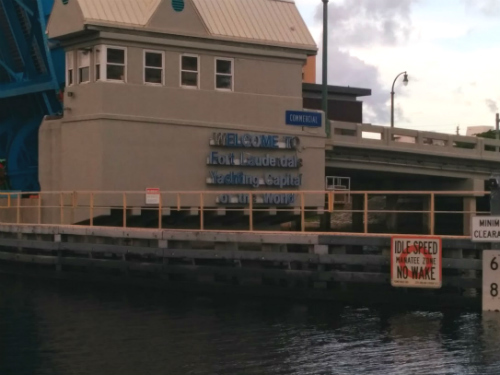 That meant waiting for 20 drawbridges to open, almost all of them on a set schedule of every half hour. 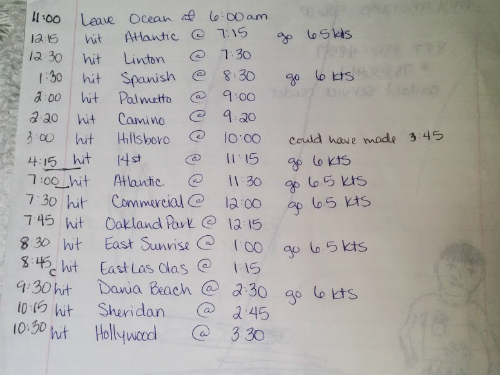 We estimated that in actual travel time at 5 knots (5 nautical miles per hour or approximately 6 miles per hour) it would take us around 6 hours to go the entire distance. In reality, with the bridge openings included our planned total time on the water was closer to around 11 hours. To help us stay on track, we made a complete list of opening times and approximate speeds. Times on the right were the estimates, times on the left were actual. To help us with our planning, we utilized Dozier’s Waterway Guides for the Southern ICW. It was the most highly rated guide by Practical Sailor reviewers and also had good reviews online. The guide proved to be very helpful with bridge schedules and phone numbers (though we were able to contact all of them by VHF radio channel 09), along with additional navigational suggestions and good listings for dockage and anchoring down the entire path. Our original plan was to head out by 6 am on Monday morning and hopefully make it to our new marina between 3:30 and 4:30 in the afternoon. However, when we woke up on Sunday morning and looked at the forecast for Monday, we were concerned about the potential for serious storms on Monday afternoon so we decided to head out Sunday and split the trip into two days instead. We were able to keep mostly to schedule with one minor exception, we missed our first bridge entirely in the planning, putting us behind a full hour! While the road directly to the South of our marina in Lantana was called Ocean Ave, the actual bridge was called the Lantana Bridge… unfortunately, the very next bridge (an hour drive to the South) was actually called Ocean Ave. While this certainly was disappointing to us, at least it didn’t negatively affect our trip since we were no longer fighting the clock to get in on time the first day. Even our cruising guide was confused, calling both bridges Ocean Ave. 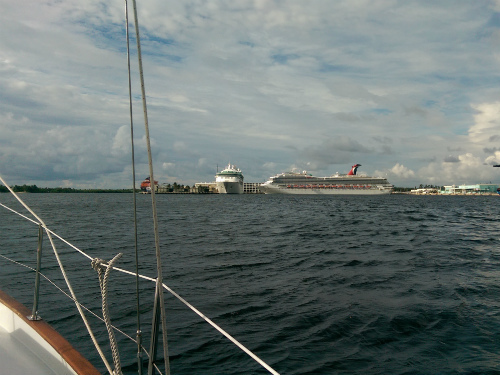 It was a little nerve-wracking sharing the water with huge cargo and cruise ships in Port Everglades! At least the scenery was beautiful. 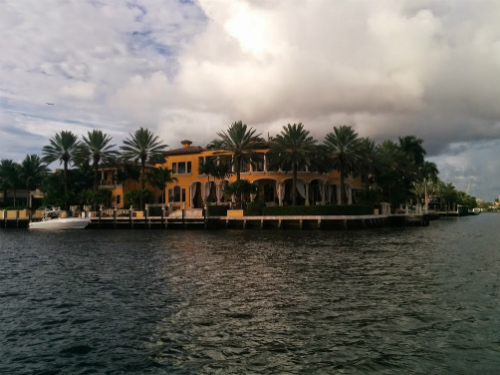 The houses on the ICW are extravagant displays of wealth and status. 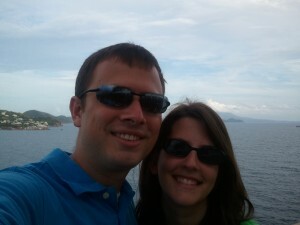 Overall, our progress was blessedly uneventful…no storms, no engine failure, and no problems docking. A good trip in our book.